Angelo Carletti. Summa angelica de casibus conscientiæ. Nuremberg: Anton Koberger, 10 February 1492. 22 cm. Contemporary limp vellum with ties. Blessed Angelo Carletti di Chivasso (d. 1495) received the degree of Doctor of Civil and Canon Law from the University of Bologna. He later entered the Franciscan Order. His best-known work is the Summa angelica de casibus conscientiae more commonly referred to as Summa angelica in his honor. 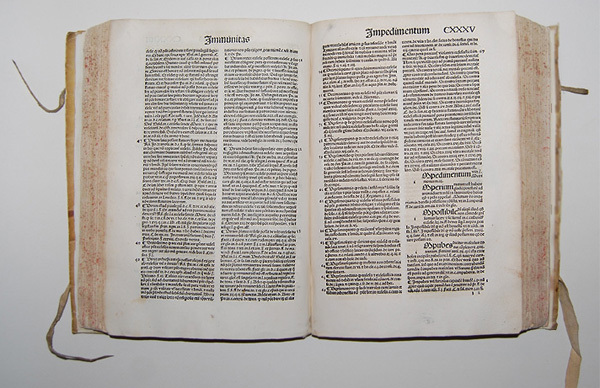 The first edition of the Summa angelica appeared in 1476, and by 1520 had gone through 31 editions. 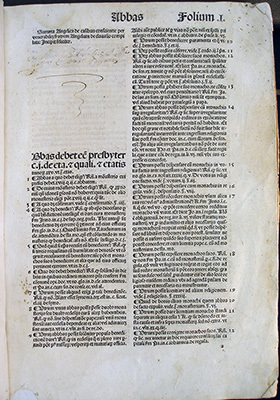 The work was condemned by protestant reformers, and Martin Luther publicly burned an earlier printing of the same edition. This edition, although the fifth, was the largest and was probably chosen by Luther for theatrical appeal. The Summa is a reference work divided into six hundred and fifty-nine entries in alphabetical order, forming what now might be best termed a dictionary of moral theology. This work belongs to the genre known as “cases of conscience” and the field of casuistry. Following the Council of Trent (1545-1563), theologians systematically addressed questions regarding personal, social, political, and religious duties, specifically in terms of the relative rights of Church and State. The order of authority was first biblical (divine) law, next natural law (which tended to be poorly defined), and finally canon law (law of man). Casuistry (from Latin casus) is now used in juridical and ethical discussions of law and ethics. It is the origin of case law in common law, and the standard form of reasoning applied in common law. The printer, Anton Koberger (c. 1445-1513), established the first printing house in Nuremberg in 1470. An ambitious businessman, he quickly became the most successful publisher in Germany, and at his peak, had 24 presses in operation and employed 100 craftsmen. His workshops produced about 200 works before 1500. He prized beautiful texts and promoted the inclusion of decoration in printed works. He and his godson, Albrecht Dürer (1471–1528), actively collaborated on the development of woodcut illustrations. Koberger closed the Nuremberg printing house in 1504.